YayPay is a smart accounts receivables management solution that helps financial teams perform better, manage receivables more efficiently, and get payments from clients timely. The software combines real-time accounts receivables, analytics, and cash forecast. YayPay takes care of all the grunt work of payment collection, taking all invoices and turning them into statements, and delivers them to customers before their due dates. These reminders come with easy payment options that allow them to pay and settle their invoice in minutes. With YayPay, companies enjoy AI, robotics, process automation and machine learning that turn finance teams into revenue powerhouses. The software automates payment collections from customers through personalized interactions. On top of that, YayPay predicts cash and gives workflow remedies that save collection costs and streamline cash flow. 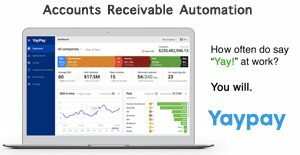 YayPay is designed to take all the grunt work of accounts receivables management and automate them all so you get paid faster and timelier. The software helps speed up your cash flow and manage your payment collections in a very efficient manner, saving you time and costs that stem from handling invoices, reminding clients, and collecting payments. With YayPay, your account receivables specialists are able to save hours of their time per day, enabling them to do more than just handle invoices, calling and following up clients to remind them of their balances, and more. From a single, unified interface, you can call or email clients about their payables. The system tracks all your communications, allowing your to follow-up more efficiently and effectively. Powerful AI and machine learning analyze your payors’ credit risk an historical payment behavior to predict payment patterns, helping your accounts receivables staff to devise and implement practices that increase efficiencies. Your chief financial officer (CFO) can easily access the system and view all the information he or she needs to see payor trends, analytics, invoices performance, and AR Team efficiency among others. This visibility allows him or her make better decisions and actions on how to improve account receivables, bring down outstanding receivables and DSO by up to 30%, and further accelerate business growth. What Problems Will YayPay Solve? Many companies (including large global brands) still use Excel to manage their Accounts Receivable and Collections process. This set up demands a lot of manual work. YayPay completely automates AR. On average, the platform cuts manual AR work in half. Bringing down DSO (Days Sales Outstanding) can make a huge difference to organization’s bottom line. YayPay’s customers are treated to up to 30% reduction in DSO. Normally, AR data is decentralized and lives on a few different platforms/tools with many staff working on the same accounts. YayPay takes your data directly from your ERP and serves as a single source of truth for everyone in your organization. There are trendy and widely used systems in each software category. But are they automatically the best fit for your organization’s special requirements? A popular software application may have thousands of subscribers, but does it provide what you need? For this reason, do not blindly spend on popular systems. Read at least a few YayPay reviews and consider the factors that you want in the software such as the price, main tools, available integrations etc. Then, choose a few apps that fit your requirements. Try out the free trials of these products, read online comments, get clarifications from the vendor, and do your research meticulously. This in-depth research is certain to help you select the most excellent software application for your firm’s specific requirements. How Much Does YayPay Cost? Contact YayPay for pricing information and other product details. You can also submit a request for a demo to see if the software is a perfect fit for your business. We realize that when you make a decision to buy Accounts Receivable Software it’s important not only to see how experts evaluate it in their reviews, but also to find out if the real people and companies that buy it are actually satisfied with the product. That’s why we’ve created our behavior-based Customer Satisfaction Algorithm™ that gathers customer reviews, comments and YayPay reviews across a wide range of social media sites. The data is then presented in an easy to digest form showing how many people had positive and negative experience with YayPay. With that information at hand you should be equipped to make an informed buying decision that you won’t regret. What are YayPay pricing details? What integrations are available for YayPay? If you need more information about YayPay or you simply have a question let us know what you need and we’ll forward your request directly to the vendor.